Phillip White likes to talk to people about the town of Cliffside. Fascinated by its history and the stories of the people who have lived there, he has spent years collecting photographs, newspaper clippings and old postcards from the once booming textile village in southern Rutherford County. 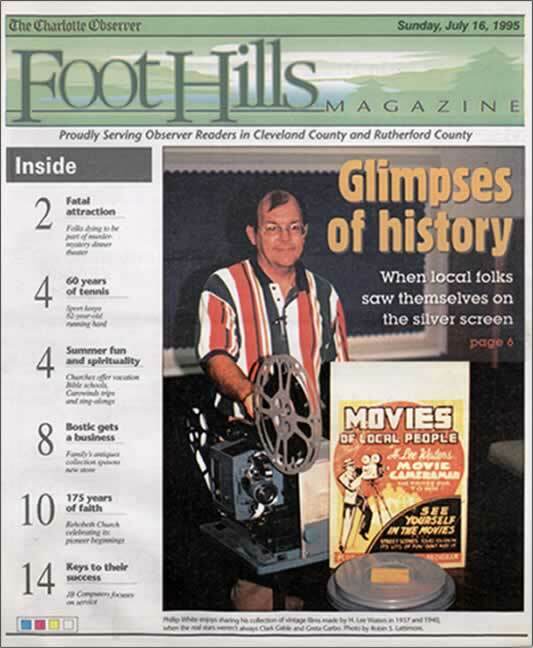 While historically significant, none of White’s printed artifacts can match the rarest gems of his collection – a set of five vintage motion pictures filmed in Cliffside and the towns of Rutherfordton, Spindale and Forest City in 1937 and 1940. In 1972 plans were being made to hold a 50th anniversary celebration of the cornerstone laying of Cliffside School. It was suggested to Phillip White, one of the planners, that the “Cliffside movie” be shown. Phillip had never heard of such a movie, and, after mentioning it to several people, learned it had been made by one H. Lee Waters of Lexington, NC. He tracked down Mr. Waters and talked him into coming to the celebration and projecting the Cliffside film, made in 1940. The school auditorium was packed, and the audience loved the film. During the screening Waters leaned over to White and said, “I ran across another Cliffside film, made in 1937, and I’ve brought it with me. Do you think the people would like to see it too?” Well of course they would, and they loved it, too. Ultimately, White purchased the two Cliffside films, as well as those Waters had made for Forest City and Spindale. He screened them for groups throughout Rutherford County. For a few years, White sold VHS cassettes of the films, then finally donated the prints to Duke University, which had begun the process of collecting and restoring all of the Waters library. In exchange, Phillip was provided with DVDs of the restored Cliffside films, which he has graciously shared with us. The restoration made a great difference in the two Cliffside films. They are now much clearer, sharper and cleaner than we’ve ever seen them. The restorers cleaned and removed the scratches and rephotographed every frame of the films. We know you’ll enjoy them. We’ve added a music track to each of the films (the originals were silent). We hope you agree the music lends “life” to them. All these tunes (by the original artists) were heard on Cliffside radios in the years the films were made, and for long afterward. It was a time when young America thought nothing of driving 100 or 150 miles to hear a favorite band in person, when even casual listeners knew who played trumpet with Benny Goodman and who Glenn Miller’s saxophonists were. It was a decade when it was the great bands that made the great song hits. It was a time when the late-night air was filled with music — live music. Radio networks began their nightly rounds of “remote” broadcasts at 11:00 p.m. or even 10:00, and for four hours you could hear a different band every half hour, coming right into your living room from one after another of America’s great dance floors. The Story of the Great Bands 1936-1945. H. Lee Waters ran a photography studio in Lexington, N.C. During the Great Depression, when families had little available money to have portraits made, he hit upon an idea that not only kept his business going, but which preserved on celluloid a large segment of the history of the Piedmont Carolinas. Between 1936 and 1942 he visited 118 towns for which he produced 250 “Local People” films. He would arrive in a given town, set up his 16mm camera at the most likely places to capture the faces of the citizens, and grind away. While in town he would drive about in his car that was equipped with billboards advertising the upcoming screenings, and two large loudspeakers mounted fore and aft, to alert the people to the wonderful movies starring themselves. In 1942, with the war underway and the economy improving, the returning demand for his studio work caused Waters to stop making his Local People movies. Thankfully, he saved prints of most of them, and in 2004 they were included in the National Film Registry. Slowly the entire collection is being restored and these valuable films will be preserved for all time. Before Mr. Waters’ death in 1997, a film was made about him and his career. 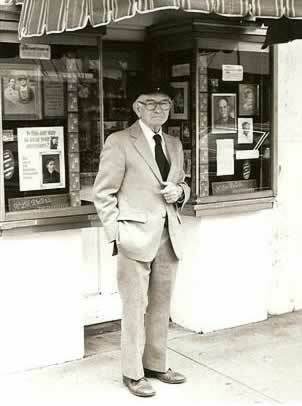 You’ll hear him tell his story and see clips from the films of other towns.